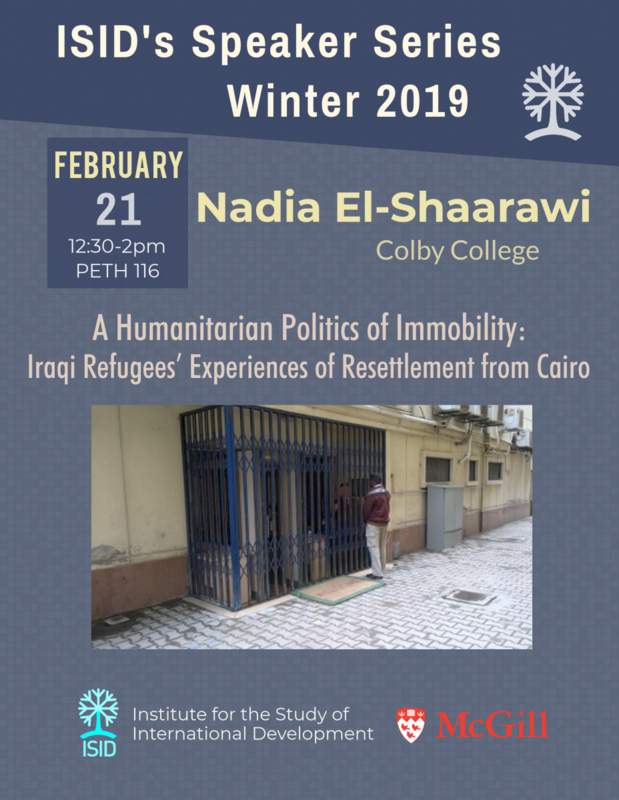 A guest lecture by Nadia El-Shaarawi of Colby College. Bio: Nadia El-Shaarawi is an Assistant Professor of Global Studies at Colby College. She is a cultural and medical anthropologist who specializes in transnational forced migration, humanitarian intervention, and mental health in the Middle East and North Africa. Her current book project, Living Uncertainty, analyzes how, in the aftermath of the 2003 invasion and the sectarian violence that followed, Iraqi refugees in the Middle East negotiated uncertain conditions of protracted urban exile and how interactions with global and international institutions and policies, especially refugee resettlement, had implications for mental health and well-being. In collaboration with Maple Razsa, Nadia is working on Insurgent Mobilities, a collaborative ethnography of the Balkan Route that refugees travelled to reach Europe. In contrast to narratives that presented the Route as either a humanitarian or border crisis, Insurgent Mobilities explores what’s revealed by viewing the route from the point of view of refugees and solidarity activists as they struggled for freedom of movement. Prior to joining Colby, Nadia was the Global Migration Postdoctoral Fellow at the Kenan Institute for Ethics at Duke University, where her work included research on the health and social effects of displacement and resettlement. Abstract: Refugee resettlement is a process where refugees are “selected and transferred” from the state where they have sought exile to another state, which offers them residence and, usually, citizenship. The language of humanitarianism and security is frequently deployed to justify its scarcity—only 1% of refugees worldwide are resettled. Despite its rarity, resettlement has recently been at the center of public contestations about migration, citizenship, and belonging in so-called “resettlement countries” like the United States, Canada, and Australia. Such debates center the state in their analyses, eclipsing the existential and epistemological implications of resettlement for refugees themselves, the vast majority of whom will never be resettled. Drawing on long-term ethnographic fieldwork with Iraqi refugees in Cairo, Egypt, many of whom were seeking resettlement, this presentation offers an ethnography of the resettlement process itself. A focus on the interactions and relationships that make up the resettlement process in Cairo renders visible how resettlement both makes possible and forecloses physical access, and juridical citizenship, in the global north. For Iraqis, seeking resettlement involved performing victimhood while simultaneously navigating competing and uncertain sovereignties. Paying attention to the process of resettlement—including how refugees negotiate the aporias of a system that offers potential citizenship but designates it as a limited resource to be allocated in conditions of exceptional humanitarian need—illuminates one way that citizenship in the global north is justified, and managed, as a scarce and exclusionary object, as well as how such justifications are negotiated by the very people the system seeks to exclude.